You’ve heard the saying “art imitates life,” right? Today, we have a few special pieces from the Frank Pollak & Sons collection that may prove this saying rings true – if you believe in unicorns, that is. The Unicorn Tappestry was created by Seaman Schepps in the United States in the 1940s. It is a carved crystal with 14-karat yellow gold detail with diamond inlays. While not likely based on a real-life animal, this incredibly unique, vintage brooch certainly harkens the glitz, glamour and whimsy of the ‘40s with a style and imaginative design that is timeless. Now this one, we’ve seen in real life: shells. These shell cufflinks by Tiffany & Co., circa 1970, look like a gold-encrusted pick from the ocean. These gently worn snail shell cufflinks are masterfully crafted and detailed, made with 18-karat gold. There’s something classy about a man who wears unique cufflinks, and with these on your sleeves, you’re sure to make a splash. Our antique butterfly brooch was created in France in the late 19th century, so as you might imagine, it has had an exciting life. This silver on gold and old-mine cut diamond brooch has spring loaded moveable wings. It measures about 2.5 inches from wing to wing, and 2.75 inches wing tip to wing tail. There are 280 old mine cut and rose-cut diamonds nestled into this butterfly’s wings, making it shimmer and sparkly unlike any butterfly you’ve ever seen. A more colorful option, if you like butterflies, is our Papillion brooch. This eye-catching and intricate brooch was created in the modern era by Caroline Nelson. 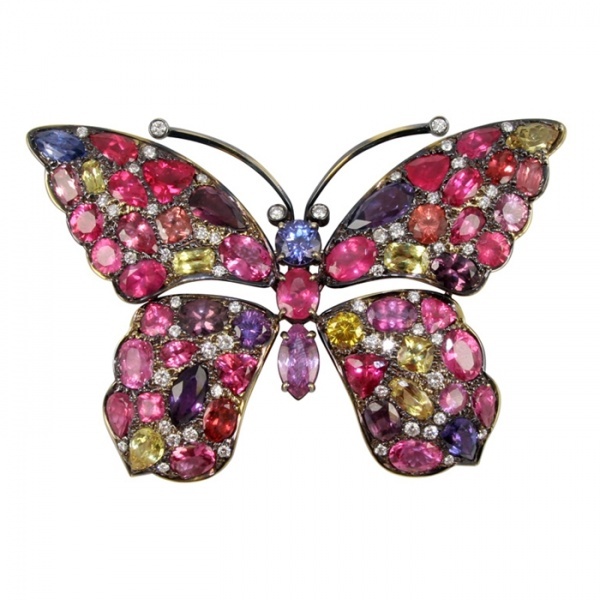 The frame is made of 18-karat gold and holds the butterfly’s intricate markings – a collection of precious sapphires, spinels and diamonds in pink, red, yellow and blue. Finally, for the puppy-lover in your life, our whimsical puppy dog brooch is the perfect gift. This fun and adorable brooch has 18-karat gold “fur” and 16 diamonds in his whiskers. With rubies in his eyes, black enamel for his nose, and green enamel on his headpiece, he’s as adorable as he is unique. While we’re not sure where this little treasure originated, it’s in pristine condition and ready to find its forever home as part of your jewelry collection. Check out even more vintage jewelry and modern pieces from Frank Pollak & Sons in our online inventory. To learn more about any item or to view anything in our collection, give us a call at 800-342-3878 today or stop by our storefront in Manhattan.